At the moment you can view the architects plans and see a computer simulation of the proposals. These are useful but cannot capture how the building will look once the work is complete. 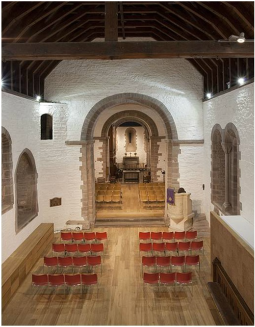 We have put together a few examples of other churches that have had major works carried out and these show how the beauty and grandeur of a building can be maintained and enhanced through these works. Photos courtesy of Communion Architects. In 2013 The church underwent a major reordering project. In the main body of the church the remaining pews were removed. 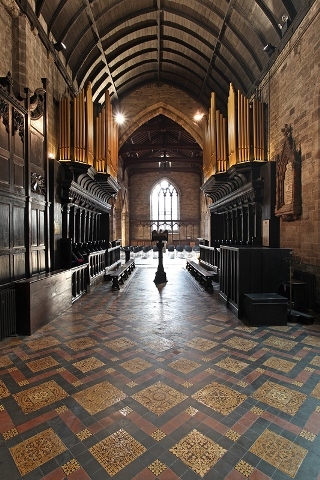 A stage area was created so that the east end of the chancel can be used for theatre, for school assemblies or as one of the possible focuses for church worship. The painted backdrop at the east end was restored, and most users enjoy this, but it can be screened off with curtains, for example for theatre use. 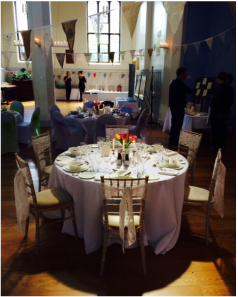 A small kitchen and large chair store has been created across the end of the north transept, allowing the church to be cleared of chairs. 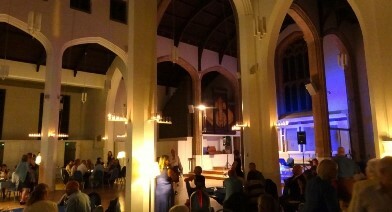 Photos courtesy of Archangel and St Paul's Church. 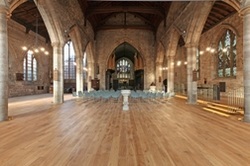 During 2011-12 the church installed a new floor and other associated work. In the process a large burial vault built in the late 1700s was discovered under the nave. The new floor means easy access to the building is now possible for all including wheelchair users and children in buggies. 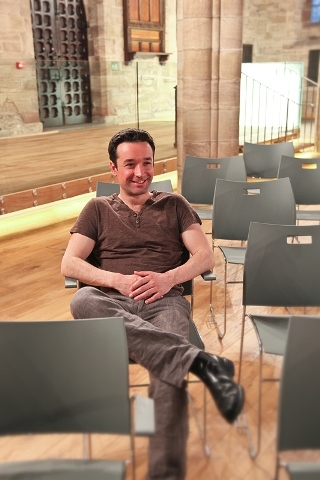 The removal of pews and the introduction of chairs, which can be cleared away into a very small area, allows the church building to be used in many different ways meeting the needs of 21st century life. 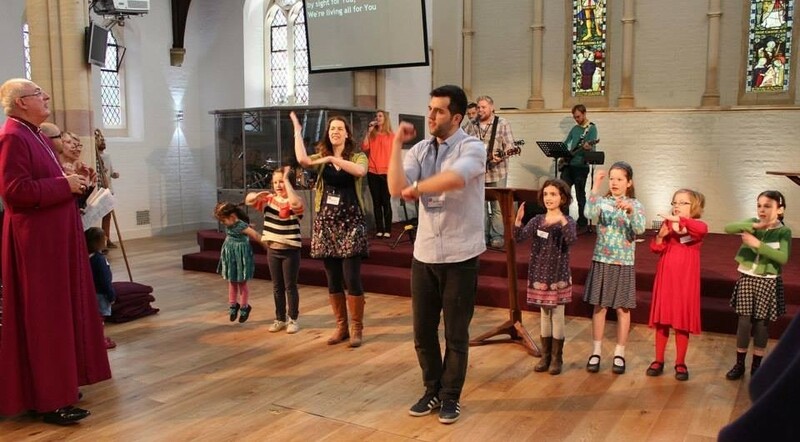 Photos courtesy of St Peters Church Farnborough. St Peter's Church in the centre of Hereford was founded in 1087 but was heavily restored in 1888 by the Victorian Diocesan architect Thomas Nicholson. This had bequeathed an internal layout that was only suited for Sunday and occasional civic services. Facilities that were associated with the day to day mission of the church today were hidden to the rear and the side of the church building and unassociated with it. It had a reputation for being cold, dark and difficult to access, while its daily mission was difficult because of inconveniently situated facilities. 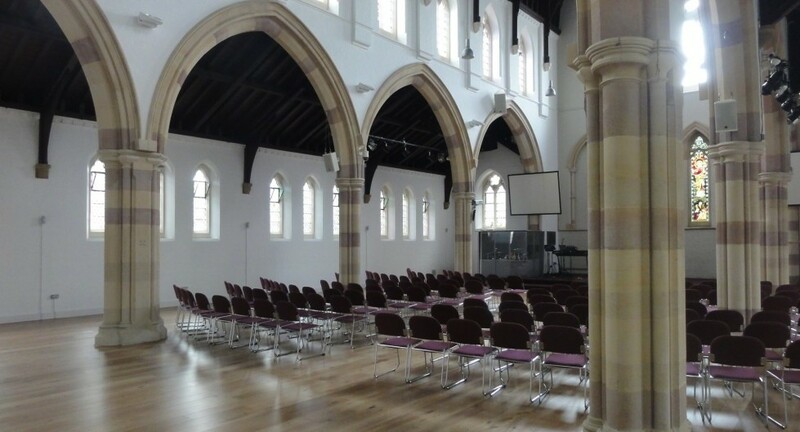 The Parochial Church Council (PCC) took the decision to reorder the building to give a welcoming and accessible entrance, provide a flexible space that could be used for any activity and create a warm, comfortable and usable building. The architects worked with the PCC to seek funding and develop a plan to bring warmth and life to the building through underfloor heating and subtle LED lighting and provide utility with a discreet kitchen. 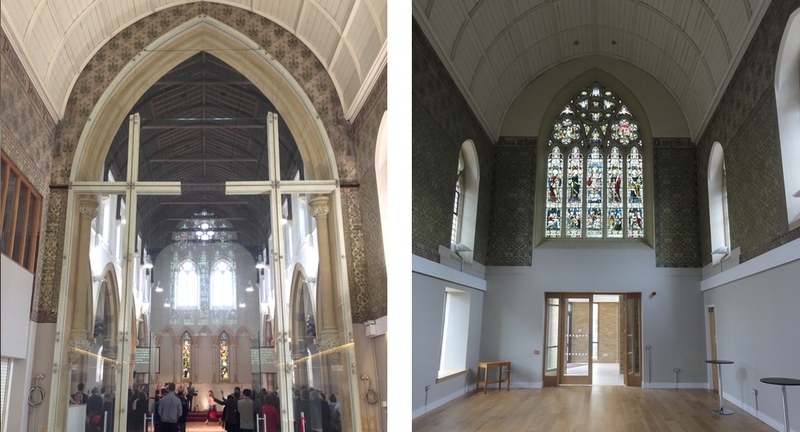 The project in this substantial Victorian church created a unified floor level where previously there were ramps everywhere, with underfloor heating throughout. A large glazed screen was introduced in the chancel arch, so that the two spaces can be used (and heated) separately. 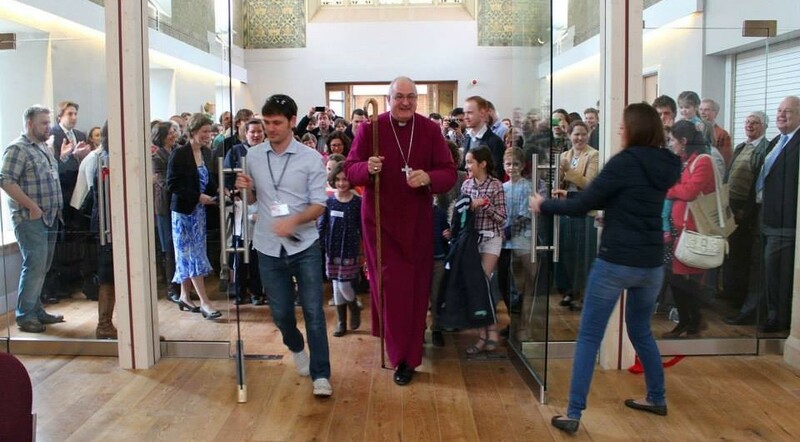 The glazing means that the church unfolds seamlessly as you enter it for the first time, and also gives parents of young children somewhere to withdraw to but still follow the service. 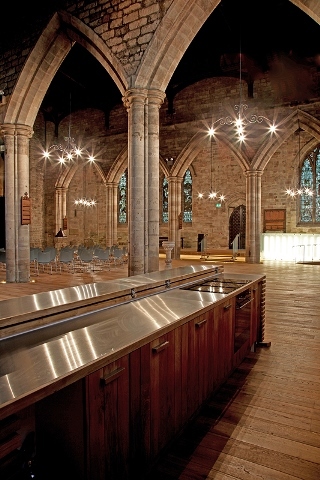 A new kitchen allows the church to offer better catering facilities, which support the greater flexibility in the building as a whole to host a variety of different forms of worship, meetings, conferences etc. A full-immersion baptistry was created in the centre of the nave, which is revealed by taking away a section of removable floor. 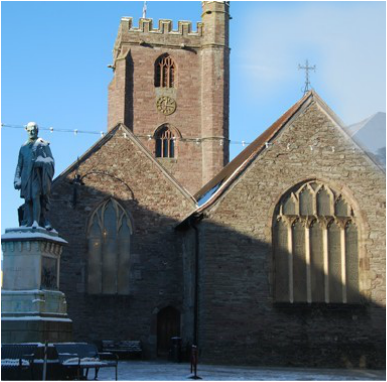 St Mary's is over 900 years old but much rebuilding of the Norman structure took place in the 14th and 15th centuries. However, it was during the Victorian period that the most extensive rebuilding, much of it devitalizing, took place. Th recent reordering came about from an empirical community review where the church asked the town "How can the church better serve the needs of the community". The response led to opening the building up more, providing a coffee shop and lots of other changes. 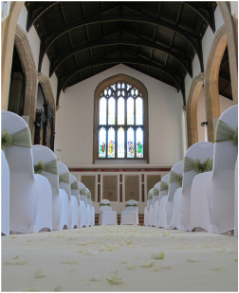 Photos courtesy of St Marys, Brecon.